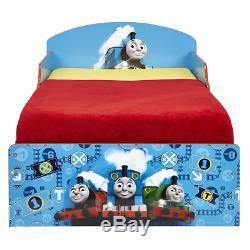 Thomas the Tank Engine Kids Toddler Bed by HelloHome. Very limited stock from our supplier. ORDER NOW to avoid disappointment! Ideal transition from cot to bed - make the move to his first big bed magical with the Thomas the Tank Engine toddler bed from HelloHome. Takes cot bed size mattress - 140cm (l) x 70cm (w). Assembled size (h)59, (w)77, (l)142cm. Suitable for 18 months to 5 years this pink kids' bed is perfect for your little Thomas & Friends fan! Easy assembly with all fixings and instructions supplied. Sturdy construction using high-grade MDF. 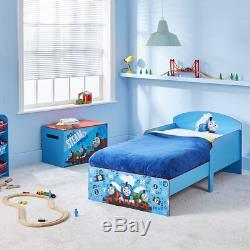 Part of the Thomas & Friends bedroom furniture and storage range from HelloHome. 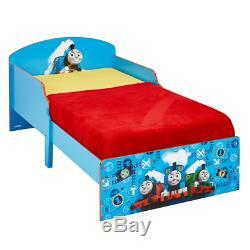 Sturdy, safe and simple to put up, this Thomas the Tank Engine Toddler Bed by HelloHome makes bedtime brighter. A great value, fun way to take the exciting step from cot to toddler bed, this kids bed keeps little ones protected from bedtime tumbles with its protective side guards, giving you peace of mind as he sleeps. 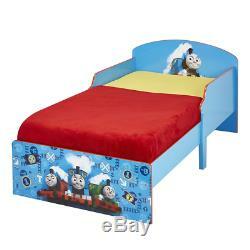 Part of the HelloHome Thomas and Friends kids bedroom furniture range, this toddler bed turns your toddlers bedroom into any Thomas the Tank Engine fans dream and, with Thomas by his side, hell be drifting off in no time. Takes a cot bed sized mattress - 140cm (L) x 70cm (W). Suitable for 18 months to 5 years. 1 x Headboard 1 x Footboard 2 x Side Panels>BR> 5 x Slats 2 x Legs Fixtures & Fittings. You may be wondering what sets us apart from other shops, and the answer is simple; we have a wide range of products in several niches at very competitive prices and most importantly one of the best customer services around. At our shop we sell unique products at great prices that cater to your passions or just simply fulfill you needs. In addition to our great every-day prices and innovative warehousing methods, were constantly offering special deals, promotions and GIVEAWAYS on the most popular items around for our buyers. Dont just take our word for it though, check out some testimonials/feedbacks from our customers. Dispatched and arrived very quickly, and item as described. Amazing service & great product. We have partnered with fulfillment centers for all order fulfillment and have our products strategically placed in warehouses across the United Kingdom and other international countries. This is one of the reasons we can provide great prices all over the world. Courteous, honest and professional support. 30 Days NO QUESTION ASKED RETRUN policy. Everyone that uses our products, come back for more. We must be doing something right! E DELIVER TO THE ADDRESS YOU PROVIDE US AT THE TIME OF ORDER. Please be aware that we cannot accept liability for any expenses incurred because of delayed or unsuccessful deliveries. Important: We use stock and price monitoring softwares to maintain our large inventory and you may have noticed that we have got tens of thousands of product listings and our softwares need time to update the whole database every day. Your satisfaction is our greatest priority and you can be sure we will try to solve any issues that you might have. All our prices include VAT. We reserve the right to terminate and cancel your contract with us if: a. We do not deliver to the geographical location requested in your order b. One or more of the items that you ordered was listed at an incorrect price due to an error in the pricing information on our store. We are a VAT registered company and can provide VAT receipt upon request. Incorrect Orders/Substitutes: In the unlikely event of receiving an incorrect order or a substituted item, please accept our apologies. I need the item right now, can I come to collect? No, we don't offer collection in person on our listings. Can I negotiate a better price? No, our pricing strategy does not allow us to negotiate prices. Not even with multiple quantities. Can I return my item? Can you deliver to USA/Australia/Canada/Russia... We deliver our items to valid UK addresses only. The item "Thomas the Tank Engine Kids Toddler Bed by HelloHome" is in sale since Tuesday, November 27, 2018. This item is in the category "Home, Furniture & DIY\Children's Home & Furniture\Furniture\Beds with Mattresses". The seller is "gear_grabber" and is located in Halstead.